Youngsville is located at 36°1′31″N 78°28′38″W﻿ / ﻿36.02528°N 78.47722°W﻿ / 36.02528; -78.47722 (36.025311, -78.477090), near Raleigh, North Carolina. According to the United States Census Bureau, the town has a total area of 1.6 square miles (4.1 km²), all of it land. As of the census of 2010, there were 1,157 people, 522 households, and 294 families residing in the town. The population density was 723.1 people per square mile (282.2/km²). The racial makeup of the town was 69.3% White, 25.1% African American, 0.3% Native American, 0.8% Asian, 0.0% Pacific Islander, 2.9% from other races, and 1.6% from two or more races. Hispanic or Latino of any race were 4.8% of the population. There were 522 households out of which 28.9% had children under the age of 18 living with them, 35.8% were married couples living together, 15.5% had a female householder with no husband present, and 43.7% were non-families. 35.1% of all households were made up of individuals and 7.0% had someone living alone who was 65 years of age or older. The average household size was 2.22 and the average family size was 2.89. In the town, the population was spread out with 26.8% under the age of 20, 8.5% from 20 to 24, 31.8% from 25 to 44, 24.1% from 45 to 64, and 8.8% who were 65 years of age or older. The median age was 32.5 years. For every 100 females, there were 92.5 males. For every 100 females age 18 and over, there were 89.9 males. The median income for a household in the town was $34,795, and the median income for a family was $43,250. Males had a median income of $32,500 versus $33,125 for females. The per capita income for the town was $21,927. About 8.2% of families and 9.3% of the population were below the poverty line, including 9.1% of those under age 18 and 2.9% of those age 65 or over. There were 562 housing units at an average density of 351.3 per square mile (137.1/km²). 7.1% of housing units were vacant. There were 522 occupied housing units in the town. 203 were owner-occupied units (38.9%), while 319 were renter-occupied (61.1%). The homeowner vacancy rate was 7.7% of total units. The rental unit vacancy rate was 3.6%. Youngsville is governed by a mayor and five-member Board of Commissioners, who are elected in staggered four-year terms. ^ Code of General Ordinances of the Town of Youngsville, North Carolina, Youngsville Board of Commissioners, December 1952 (Resubmitted April 1999), page 16 (town charter), Retrieved Jul. 24, 2017. ^ a b c "American FactFinder". United States Census Bureau. Retrieved 2015-01-16. ^ "US Board on Geographic Names". United States Geological Survey. 2007-10-25. Retrieved 2015-01-16. 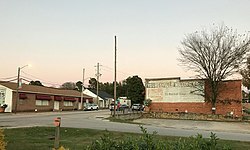 ^ Town of Youngsville, A Brief History of the Town of Youngsville, Retrieved Jan. 15, 2015. ^ William S. Powell, The North Carolina Gazetteer: A Dictionary of Tar Heel Places, 1968, The University of North Carolina Press at Chapel Hill, ISBN 0-8078-1247-1, Library of Congress Catalog Card #28-25916, page 548. Retrieved Jan. 15, 2015. ^ "US Gazetteer files: 2014". United States Census Bureau. 2014-02-12. Retrieved 2015-01-16. ^ Town of Youngsville, Retrieved Oct. 7, 2015. William S. Powell, The North Carolina Gazetteer: A Dictionary of Tar Heel Places, 1968, The University of North Carolina Press at Chapel Hill, ISBN 0-8078-1247-1, Library of Congress Catalog Card #28-25916, page 548. Retrieved Jan. 15, 2015. This page was last edited on 7 March 2019, at 18:17 (UTC).